In 2012, Webster's dictionary defines luminescence as, "the low-temperature emission of light produced especially by physiological processes (as in the firefly), by chemical action, by friction, or by electrical action." 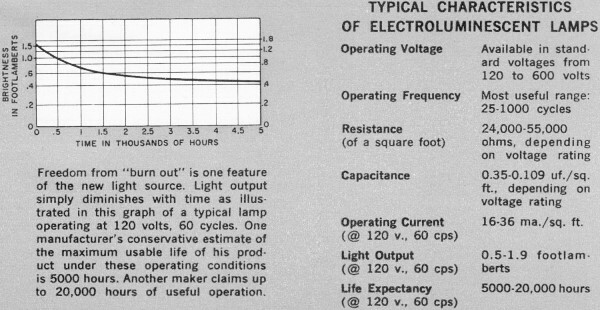 Per this 1961 article on electroluminescence in the November 1961 edition of Popular Electronics, Webster defined it back then as, "any emission of light not ascribable directly to incandescence, and therefore occurring at low temperatures." Interesting that the contrast to incandescence is no long used. Maybe in 1960 the phenomenon of electroluminescence was still new and novel enough to emphasize the distinction. 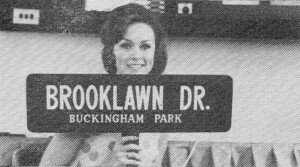 Barely a decade had passed since it had moved out of the laboratory and into the marketplace. 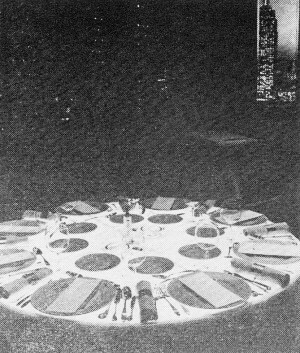 The ability to economically produce large panels for lighting was deemed groundbreaking, and indeed it was. Today, our large screen TVs rely heavily on the technology. 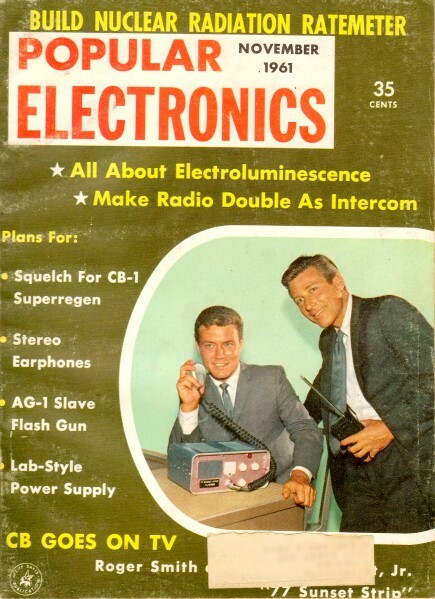 Now, as in 1961, a relatively short useful lifetime plagues electroluminescent display. At one time only a dream of science, heatless illumination is now a reality. Electroluminescence is being put to work to make paper-thin panels which someday may light your home. By James E. Pugh, Jr. In early times, the glowing tree-trunk seen by a lone traveler in the woods or the strange "burning" of the sea noticed by a wide-eyed sailor seemed to portend evil and disaster. Today we know that both are caused by chemical reactions in the cells of tiny living things, and our superstition has changed to active interest. Scientists have been fascinated by the heatless light produced by certain organisms for decades but, until recently, they couldn't even come close to duplicating it on a practical scale. The introduction of the fluorescent lamp (1938) was a step in the right direction. Here, less power was wasted in the production of useless heat than with an incandescent bulb, though the loss was still substantial. In the late 1940's, however, the phenomenon of electroluminescence, a direct conversion of electricity to a "cold" light much like that found in nature, moved out of the laboratory. Today you can buy an electroluminescent lamp for a few cents in any hardware store. 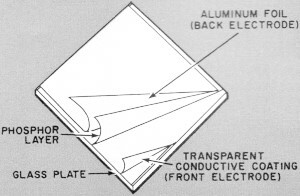 Sandwich-like construction of an electroluminescent lamp can be seen in this simplified drawing. The front plate has a transparent conductive coating which acts as an electrode, yet passes light. But just what is electroluminescence? Well, Webster defines luminescence as "any emission of light not ascribable directly to incandescence, and therefore occurring at low temperatures." Generally speaking, luminescence is caused by excitation of the electrons in a chemical compound called a "phosphor." In the case of living things which luminesce, the excitation is brought about chemically and the phenomenon is usually referred to as chemiluminescence. Therefore, electroluminescence, as you might guess, is luminescence produced by a phosphor which has been excited electrically. The manufacturing equipment, in theory, imposes the only limitation on the size of the lamps. Here, a phosphor layer is being baked in an infrared oven. Electrical "Sandwich." Though electroluminescent lamps are not yet efficient enough to provide general lighting (being most commonly used as night-lights), they have some unique physical and electrical characteristics which suggest many uses. The lamps are made by sandwiching a layer of phosphor (often zinc sulfide) between two plates of electrically conducting material. The front plate usually consists of glass having a special transparent coating which allows it to act as an electrode, and the. complete unit is not much thicker than that plate. When an alternating current is connected across the two plates, the electrons in the phosphor are excited to a higher energy level - causing it to emit a soft, glareless light with almost no accompanying heat. The color of the light depends on the selection of the phosphor and the impurities which are deliberately introduced into it. Green, blue, orange, yellow, gold, red, and white phosphors are available, but at present green yields the most light. >Contrast the way in which light is produced by an electroluminescent lamp with the operation of standard fluorescent or incandescent units. Though a phosphor is also used in the fluorescent lamp, it is not excited directly by an electric current - but rather by ultra-violet rays. These rays are produced (along with wasted radiations at other frequencies) by an electrical discharge through mercury vapor gas. In the case of the incandescent lamp, of course, the light is only a byproduct of the heat generated in a fine wire by the passage of an electric current. 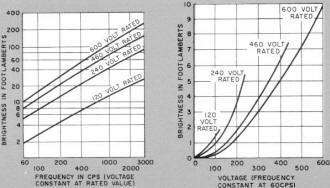 Graphs show brightness versus frequency (left) and voltage (right) for lamps of different ratings. Advantages and Drawbacks. 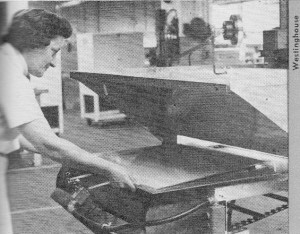 The new light source is usually produced as a flat sheet, but it can be cut into almost any conceivable shape. And, since no vacuum is required for its operation, the only limits to its physical size are those imposed by the manufacturer's equipment. One unit recently made by Sylvania measures eight by two feet - a whole wall could be made to glow with a soft, pleasant light by installing a number of these panels side by side. Freedom from "burn out" is one feature of the new light source. 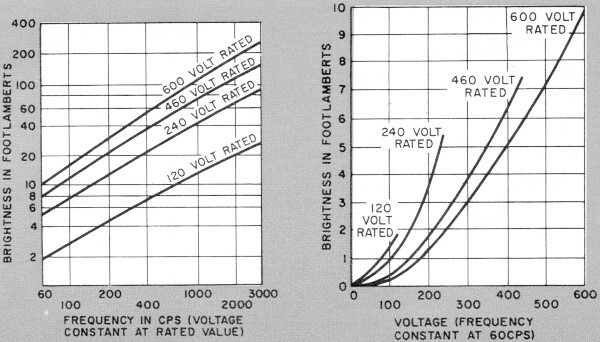 Light output simply diminishes with time as illustrated in this graph of a typical lamp operating at 120 volts, 60 cycles. One manufacturer's conservative estimate of the maximum usable life of his product under these operating conditions is 5000 hours. Another maker claims up to 20,000 hours of useful operation. The electroluminescent lamp's main drawback is its present inability to produce enough light for high-intensity applications. The light output of a given phosphor, however, can be increased by raising its supply voltage and/or frequency. 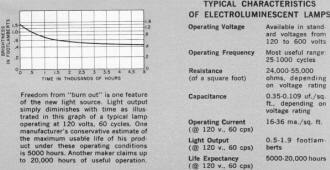 Though 120-volt, 60-cycle operation is common, special oscillators have been used to provide higher frequencies (up to 20,000 cycles), and lamps rated at voltages up to 600 are readily available. An interesting idiosyncrasy of these lamps is that, with some phosphors, a color shift occurs as the frequency is raised. In the case of one green phosphor, the color changes to blue at frequencies over 400 cycles. (@ 120 v., 60 cps) 16-36 ma./sq. ft. It will be a while before you can light your house with glowing ceiling or wall panels but, in the meantime, electroluminescent lighting will find plenty of applications. In addition to their other advantages, these "miracle" lights have a usable life expectancy of up to 20,000 hours. During this time a burn-out never occurs - the light intensity simply decreases slowly until it reaches a level so low that the unit must be replaced. Then, too, power consumption is quite low. 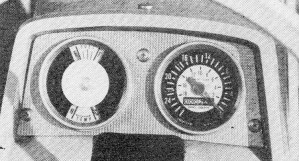 A Westinghouse "Rayescent" lamp, for instance, draws only 0.6 watt per square foot when operating at 120 volts, 60 cycles. What may be the world's largest electroluminescent lamp measures eight by two feet. It has a brilliance of five foot-lamberts, an estimated life of five years. Present and Future. Long life, freedom from "catastrophic" burn-out, and glareless light make these lamps particularly well suited for use as indicators of all kinds. 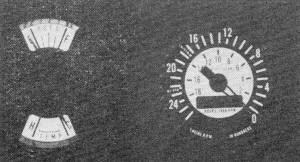 Among the applications in this category which have been suggested or already developed are lighting for aircraft, auto, and boat instrument panels, highway signs, and "read-out" numbers. >Interior decorators, too, are excited by the possibilities of this flexible light source. Glowing walls and ceilings (primarily for decorative effect rather than illumination) are already a reality, and electroluminescent panels have been incorporated into many types of furniture. Perhaps in the not-too-distant future this revolutionary lighting material will be improved to the point where it can be used for general lighting as well as decoration - and you may have to look in an antique store to find one of today's "old-fashioned" light bulbs. Electroluminescent lamps are well suited for use as indicators of all kinds.